Glossy RED collapsible Gift Card Box, Premium Gift card box, high end RED gift card box, RIverside Paper Co.
• A red collapsible box - 3 5/8 x 3 ½ x 1 ½”. • An insert (black) to hold the gift card. • A hand tied gold bow. • A gift tag. Designs will vary. • Minimum order 25 sets. • Allow 48-72 hours to ship. 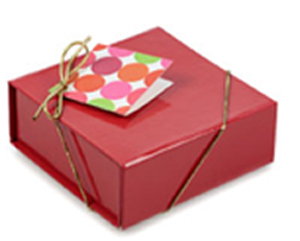 Your gift card box will be a keepsake long after the gift card has been redeemed. These high quality boxes will be used over and over again by the recipient. Glossy Red exterior and interior.